The St. Louis Cardinals may have lost to the Chicago Cubs in the playoffs, but they don't have anything to be ashamed of. They won 100 games in the regular season, continuing their run as a perennial contender. And part of the credit for this current version of the Cardinal dynasty must go to their manager, Mike Matheny. The fact was, I wanted the job. I was excited about the possibilities. I closed with "I'm not guaranteeing this is what's going to happen to our boys, but I want you to see that this system works." The interview was not for manager of the St. Louis Cardinals. It was to coach a little league team of 10-year- olds. Matheny must interview well. He not only got the little league gig, he got the big league one too, taking over a defending World Series champion from a retiring Hall of Fame manager with no managing experience himself (other than with the kids). Since then he has returned the Cards to the playoffs for four straight years. Before agreeing to coach a bunch of 4th graders, Matheny read the riot act to the kids' parents. "I've always said I would coach only a team of orphans." The problem with youth sports isn't the youth, he said. It's the parents. Heckuva thing to say in the face of said parents. They were to attend games and not stand out in any way. They could help only by playing catch and hitting grounders with their kids between practices and games. They were never to say a word to the umpire. And no lobbying coaches on behalf of their child. Any infraction of said rules would result in little Johnny being summarily dismissed from the team. 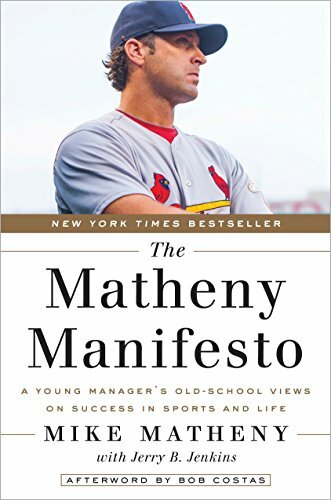 The riot act was leaked online, gained popularity, and was dubbed (by an alliterator other than Matheny) as "The Matheny Manifesto." In this book of the same title, he teams with Jerry Jenkins of Left Behind fame to take his show on the road. His rules for his little league players don't just work with the Cardinals. They can work everywhere: "I also want to examine how these values apply to life beyond baseball, beyond sports, and can plant a seed of hope in the next generation." A little grandiose perhaps. But who would've thought a little league manager could take over the Cards—and continue to win? The result is a beautifully readable and morally meaty sports book. Matheny and Jenkins tell stories well from Matheny's own playing career. He racked up Gold Glove awards as baseball's best defensive catcher—the position that births future managers. He broke Major League records for catching consecutive games without an error (252—more than 2000 innings!) and 1565 straight defensive chances. His most memorable highlight was taking a fastball off the face … and not falling down. He just stood there, hand on hip, more stoic than anything. Current players marvel at his grit (as will anyone who hunts down that clip on YouTube). Catchers are famously zealous about their toughness. So this is also a mark of courage: Matheny argues we shouldn't take toughness so far. Baseball's move, in concert with football, to be more diligent about guarding against concussions is a welcome one. Matheny retired with post-concussion syndrome which caused him to lose his balance, his concentration, even his sense of direction around his neighborhood. It may not look as manly for a catcher to sweep tag a slide at the plate, but it can lengthen lives, so Matheny is for it. Looking at that clip of him spitting blood and teeth, no one can accuse him of meekness. Unless it is for his Christian faith, or so he fears. He worries about Christians being perceived as wet noodles, more Ned Flanders than Mike Matheny. He worries too much, I think. The parts of faith he explores with any texture have more to do with the particular history of American evangelicalism than with the imperatives of the Bible. For example, he was thrown out of a frat party at the University of Michigan for refusing to do shots. Courageous, but not exactly canonical. He's tempted to punctuate his protests to umpires with the occasional F-bomb (aware that its rarity from his mouth would accentuate its effectiveness!). To do so would "jeopardize everything I stand for." Here Christianity is reduced to not drinking and not cussing. To Matheny's credit, he includes not not evangelizing. A preacher close to one of his teams accused him of "turtling up and hiding" his faith. So he tries to be more forthright bearing witness to it. I just wish he'd talk a bit more about Jesus rather than his own experience not doing things. It's not exactly rare anymore, generations into the life of the Fellowship of Christian Athletes and many similar organizations, to find an athlete memoirist standing up for faith.